Ever wondered why our months are not of equal measure, even though the moon comes around every four weeks or twenty eight days? Traveling though California; which few would disagree is the hippiest (as in peaced out, and earth lovin’) land on earth, I was bound to come across some new-age concepts (some questionable, others believable) to marvel over. One conversation with a Belgian traveler linked me up to a website which discusses the 13 Moon Calendar… it got me thinking about biodynamic farming. Biodynamic farmers use planetary rhythms to plant and tend to their crops. Biodynamics is a science of life-forces, recognizing and utilizing the principles of nature. One aspect of nature that biodynamic farmers give great importance to is the movement and presence of the sun, moon, planets and stars and how these changing cosmic forces influence the growth and form of a plant. It’s obvious to see the impact of sun and moon on earth by the experience of different seasons throughout the year, and of course the simple change from day to night. Biodynamic farmers use the moon cycles, for example, to estimate the amount of ground water rising to the surface at Full Moon as well as when extra sap will leak from plants whilst pruning (which also happens around a full moon). The Gregorian calendar is the internationally accepted calendar which was introduced by Pope Gregory XIII (hence the calendar name) and started from 15 October 1582. It does not follow the cycle of the moon otherwise we’d have thirteen months in the year instead of the January to December we have now. The Natural Calendar is a 13 month calendar. Every month is exactly the same, 28 days long. Interestingly in 1931 the International Chamber of Commerce actively supported the use of this calendar as have prominent people like Eastman Kodak and Mahatma Gandhi over the times. Other than making the organic farmers lives simpler it also makes accounting somewhat easier as it would mean that each date would fall on the same day of the week every year. 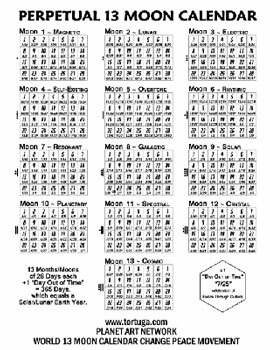 The Druids, Incans, Mayans, ancient Egyptians, Polynesians and Lakota peoples have all used a 28 day month, 13 moon cycle year calendars to work more in sync with nature. With the proliferation of environmental consciousness amongst the masses and steady increase of organic and biodynamic farming around the work would it be too radical to suggest we change to the Natural Calendar?